Masitsa’s opioid use disorder began when she was prescribed Percocet after the birth of her first daughter 10 years ago. After five years struggling with heroin use, Masitsa, pregnant with her second child, heard about an inpatient program through Swedish Medical Center that supports pregnant and parenting women with substance use disorder. She was in her second trimester when her mom took her to the program on Aug. 3, 2017. The 20-day medication-assisted treatment (MAT) program combines the use of medication, counseling and behavioral therapies to treat patients diagnosed with opioid use disorders. This program is supported through the Affordable Care Act Medicaid expansion. The Health Care Authority is the Washington state agency responsible for community-based behavioral health, including recovery programs such as the one Masitsa attended. In addition, Masitsa took classes to prepare her for welcoming her new baby and recovery, and got intensive outpatient treatment after she completed the inpatient program. She continues to attend a support group with other moms in recovery. “I felt confident leaving that I had a plan,” she said. Masitsa has been in recovery for a year and a half. Her 11-month-old daughter, Nala, is healthy and outgoing, hitting every developmental milestone. The program completely changed her life, she said. Opioid response has been a priority for Gov. 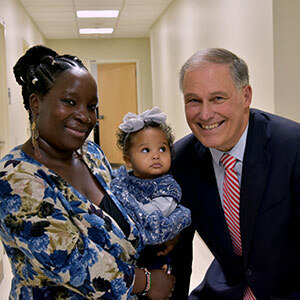 Jay Inslee who launched a response plan in 2016 to reduce the number of prescribed opioids in our state, increase public education, and make treatment more available through a hub and spoke opioid treatment model.